excellent resistance to fuels, oils and most organic solvents, and is ideal for use at low bolt loadings. Meets the requirements of most European and US motor manufacturers, plus USA Federal and Military specifications. 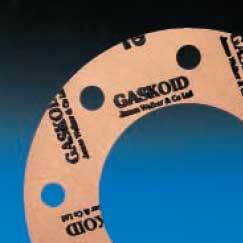 Precision cut gaskets to any shape, size or quantity. In rolls: 1m wide to any length. Thicknesses: 0.15mm, 0.25mm, 0.4mm, 0.5mm, 0.8mm, 1mm, 1.2mm, 1.6mm, 2mm, 3.2mm.